First Drafts: format as you go, or get it down as fast as you can? 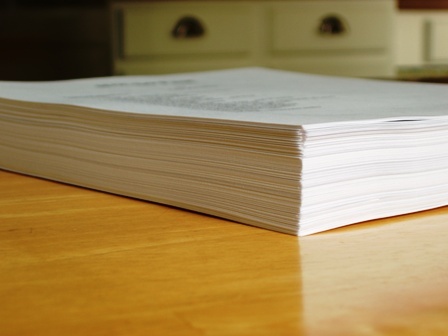 The best writing advice I've ever heard was to stop editing your first draft, and just get it all down on paper. You can always go back and fix things, but while you're writing that first draft, just get it all down. I've heard story after story from other writers that it took them 7+ years to write their first novel, because they would go back and fix every sentence after writing it, staying in chapter one for a lifetime. The simple fact is, most people need to write several novels before they start getting it right. Thanks to this advice, I scratched a 10K start to a novel I had and started a fresh one with the intent to simply finish it, learning as I go. I wrote a 48K book in 4 months, and I then wrote 50K of my second novel all during the month of November thanks to NaNoWriMo. I just got it out as fast as possible, writing in windows notepad because there's no spelling or grammar check to slow me down. I even started writing everything in one large block. I stopped making paragraphs as I went along, made no attempt to format the text, just got it all down. My question is this, is it best to do what I just described on your first draft, or would it perhaps save you a little time to at least try and form paragraphs as you go. I have yet to edit my first manuscript, so when I do that I guess I'll find out. If it is a huge pain to format, perhaps I'll start making paragraphs as I go, but I'm not so sure. I expect to change a lot as I edit, and it's then that I'll finally be able to look at each sentence critically. I think it's in this mindset that I could best decide where the next paragraph should start. Listen to Mike's podcast and find out what he has to say about this question, and stay subscribed to this blog to hear more about my findings as I go back and edit my un-formatted manuscript. I would love to read your comments, maybe you have some experience with this and wisdom to share. Thanks for reading. I at least format as I go and let Word or GDocs catch some typos as I go. I've always read "don't edit as you go" to mean don't make sweeping changes re: plot/mechanics or worry about grammar/line edits. The stream of consciousness approach you're taking wouldn't work too well for me I don't think. But hey if it works for you that's what matters. Hey, thanks for the comment Scott! I've heard your name around the podisphere, I see you're a fellow believer as well, cool! And rare :) I really appreciate your comment and sage advice. I don't think it would slow me down too terribly to form paragraphs, I'm not sure. I guess I'll find out what works best for me. I'm definitely going to check out your stuff, expect comments on your blog soon, I see you have one about the recent #scifichat, which I found interesting as well. Thanks again! You'll find if you get to know them there are more brethren in the podiosphere than you might guess, but yeah folks that wear it on their sleeve (yours truly) are perhaps rarer. Experimentation is the key. I find that advice of almost any sort boils down to try what you can, keep what works, and bin the rest. The same goes for responding to criticism. Tag me some time, I'd love to hear about your work and let me know how I can help. Thank you so much for your kind offer, when I start releasing one of my novels as a podcast, I'll definitely tap you. I'm a graphic designer by trade, so if you need any help in that arena, let me know. I'm now very curious to know who in the podisphere is a brother. Thanks! Thanks for linking to the image of my manuscript! Glad my wordiness could illustrate your post about first drafts. May you all continue to be productive in your work!